STABILicers Sport Ice Cleats were developed for our serious sports enthusiasts. We know that the winter weather will now slow you down, so we have designed a product that can help you enjoy it with a little less risk. Whether you're hiking an icy trail, going for a winter run, or just getting out for a latte in a blizzard, STABILicers SPORT provide confidence-inspiring grip. An aggressive cleat and tread combination create perfect mobility and traction. Engineered to be lightweight with Tension-Fit Binding, STABILicers SPORT hold securely to your favorite running shoe or hiking boot, and can be worn with most casual footwear. Full foot slip protection with heel and forefoot cleats maintains traction throughout your natural stride while walking or running. Dual-Density TPE Elastomer construction with replaceable cleats provides long-wearing durability. Lightweight TPE Elastomer holds STABILicers SPORT securely in place. Traction tread outsole and cleats contact walking surface, providing superior grip on ice, snow, rock, and pavement. Replaceable cleats save money and increase product longevity. New Velcro Powder Strap keeps SPORT securely in place for rigorous activities such as snow trekking and trail hiking. What kind of shoes can I use my STABILicers SPORT with? How do I attach STABILicers SPORT to my shoes? STABILicers SPORT have an Elastomer tension-fit binding system that will keep them snugly in place. Because STABILicers SPORT stretch over a shoe or boot they take more effort to put on than the original STABILicers making them less desirable for anyone who has arthritis in their hands. Will my STABILicers SPORT stretch out, making them not fit over time? STABILicers SPORT are made out of a special Elastomer compound that allows them to have a great memory and are designed to hold their shape. However, if left on a pair of shoes or crumpled up in a closet, they may change their shape slightly. 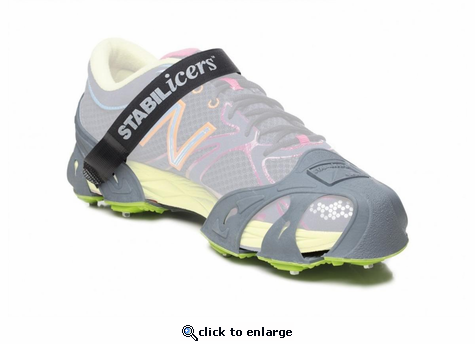 On what surfaces can I wear STABILicers SPORT? STABILicers SPORT can be worn on most surfaces found outdoors. They are not intended for indoor use and can scratch floors and catch on carpeting. STABILicers SPORT are also not designed to work on hard slick surfaces such as tile, polished stones or metals that are totally smooth. Do STABILicers SPORT provide traction on clear pavement or sidewalks? Yes, STABILicers SPORT grip pavement, rock, sidewalks, and most outdoor conditions.